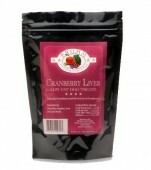 A combination of fresh liver with Wisconsin cranberries. A crunchy low-calorie, low-fat treat. Ingredients: Wheat Flour, Cranberry, Liver, Salt, Garlic Powder.